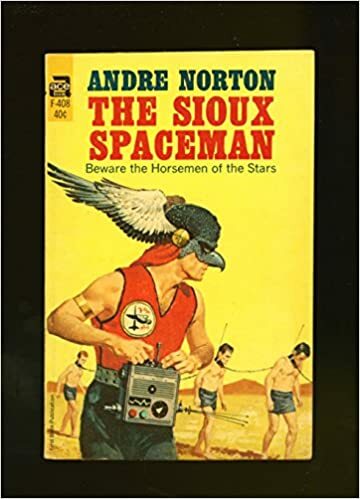 I've been re-reading my collection of Andre Norton sci-fi (this link takes you to a full bibliography). 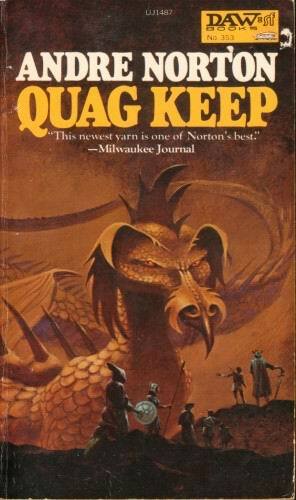 If you have never read Andre Norton's books, you are missing out. She wrote classic science fiction, time travel, fantasy, cross-worlds stories, adventures, historical fiction, YA, and pretty much everything in between. I discovered her books when I was in sixth grade and I've been a huge fan ever since. Here's my take on the two I read most recently. This was not one of Andre Norton's better stories. 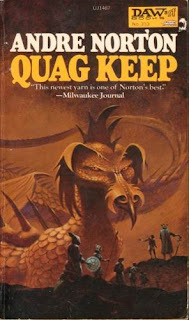 It's a novel based on one session of Dungeons and Dragons back in 1976, according to the foreword Norton wrote for the book. The whole story felt contrived and forced to me. It also wasn't one of her books that sucked me in and kept me up until 3 am turning just one more page. So unless you are a big D and D historian, this one is probably one to skip. If you are into D and D history, this blog makes some interesting points about the game and the book. My rating - 3 stars mostly for bleh plot and characters. It was okay, but nothing wonderful. Again, not one of Norton's better stories but still entertaining. In this book, Earth has had quite a few nuclear wars that have wiped out almost all white people. The main character for this book is a Native American from the Sioux tribe. This flavors a lot of the book. I found it to be the most intriguing aspect of the story, which is basically humans reach the stars only to find an alien race is more powerful and has enslaved most of the other aliens they've encountered. Our intrepid Sioux warrior makes contact with the natives and concocts a plan to overthrow their alien masters. It was a fun diversion but the tropes which would have been fresh back when this was written are pretty much overdone these days and pretty stale. Norton did have some interesting twists on the idea, though. This one is worth a read if you can find it. My rating - four stars. This is a sequel to The Zero Stone and, in my opinion, it's better than the first book. Murdoc Jern, a pretty useless person with a load of personal baggage, inherits a weird gem in the first book, one that a lot of people are willing to kill for. Strange things happen, and Murdoc ends up stranded in space with a mutant alien named Eet. Things happen and they end up rescued and things mostly sorted out by the end of book one. 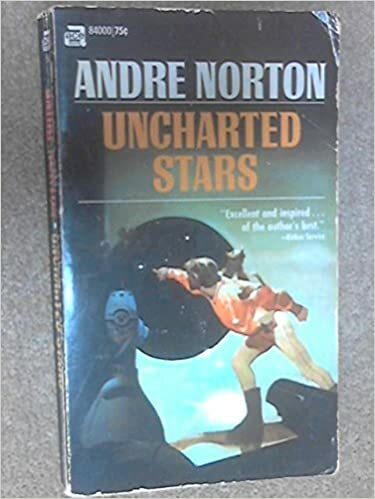 Book two, Uncharted Stars, opens with Murdoc and Eet on a quest to find the source of the Zero Stones, the weird gem from book one. The story takes some interesting twists and turns and has plenty of action and adventure. I would have enjoyed it more except the character of Eet really gets under my skin. He's an overbearing arrogant bossy little animal that I really wanted to strangle more than once, but Murdoc dutifully does whatever he's ordered to do. In many ways, Murdoc is the stupid teenager who can't think for himself and when he tries, he screws things up horribly. Eet treats Murdoc as a servant, a lesser being. Eet also has his own agenda that he won't share. I can't give this one a complete thumbs up mostly because the characters are mainly unlikeable and the relationship dynamics are really messed up. It does hold together and makes sense within the society Norton has created for these books, though. The books are worth reading at least once mostly because the range of planets and ideas hidden within the mediocre storyline are incredible. I have a lot more Norton to read still. She was very prolific. Many of her books hold up well, despite being written forty or fifty years ago. It also gives me hope to see she wrote some brilliant stories in a huge array of imaginative settings, but she also cranked out some plodding stinkers, too.